All aboard for take off. Full fun ahead. Everything is so easy to get to in Kalamazoo. The Kalamazoo/Battle Creek International Airport (AZO) is served by major airlines and offers worldwide connections to major hubs throughout the Midwest. Car rental agencies are located at the airport and throughout Kalamazoo. 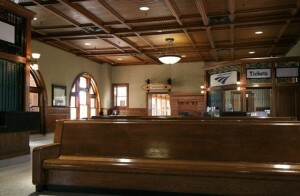 The historic downtown transportation center has trains to and from major destinations like Chicago and Detroit. You also have convenient access to Greyhound and Indian Trails bus lines, and once you’ve arrived, efficient local public transportation is available from Metro Transit bus service, as well as limousine and tax services. Providing luxury transportation to the southwest Michigan area since 1995. Car Service at the Airport. Rental vehicles including economy, full size, luxury, minivans, SUVs, pickup trucks, cargo vans and more. Ford dealership with a comprehensive selection of new used cars, trucks, and SUVs. The ease of flying in and out of theKalamazoo/Battle Creek International Airportimproves your entire travel experience. Airlines servicing AZO include: American Eagle, Delta and United. Amtrak offers daily trains from Kalamazoo to Chicago, Detroit, Pontiac and Port Huron. Indian Trails is Michigans premiere charter bus servicefamily-owned and operated since 1910.
Leisure Limousine was formed on the premises of providing unparalleled limousine and sedan transportation. The ease of flying in and out of theKalamazoo/Battle Creek International Airportimproves your entire travel experience. Airlines servicing AZO include: American Eagle, Delta and United. Kalamazoo, Portage and the surrounding townships are served by Kalamazoos Metro Transit bus service. Buses stop at marked stops and shelters.